Passover begins at sundown tonight. While I no longer celebrate it, I have many fond memories of Passover seders from my childhood. Unfortunately, the food is not one of them. But the rest of the meal was somewhat pedestrian and a little bland. The roast chicken was adequate, the frozen broccoli was usually overcooked, the matzoh stuffing was a far, disappointing cry from the Pepperidge Farms stuffing that accompanied our Thanksgiving and Christmas (yes, I get the irony) turkeys. And the sponge cake with either whipped cream and strawberries or chocolate sauce? Only good because it was the only dessert we were going to get, unless we wanted to eat the stale chocolate-covered coconut Passover macaroons our Great Aunt Hansi (who was neither great nor an aunt, but that's a different story) brought to the seder every year. Like the ubiquitous Christmas fruitcake, it might even have been the same box. Passover chocolate is not the best chocolate, but when it is covering the dreaded shredded coconut, it is awful. And yet, every year I would take one and take a gingerly bite, hoping against hope that it had somehow miraculously turned into a Snicker's bar but, alas, no such luck. And the week would get progressively worse. There is only so much matzoh and butter or matzoh and peanut butter a schoolchild can tolerate at lunchtime. And tuna or chicken salad and matzoh sandwiches leave a lot to be desired. So, much as I actually did enjoy the seder, not to mention the four glasses of concord wine we were allowed - nay, required - to drink, the rest of the week dragged. Especially if Easter happened to fall during Passover, because my all-time favorite sandwich in the world was an egg salad sandwich, and my mother only made them on special occasions, and after we had gathered the 3 or 4 dozen dyed hard-boiled eggs the easter bunny had hidden all around our yard on Easter Sunday. Normally, that meant egg salad sandwiches for a week! Sometimes, though, it meant egg salad matzoh sandwiches, which was always such a disappointment to me because I knew it might well be a year before I would see egg salad again. But I digress. And there was one other dish that made it much easier to give up bread for the duration. And that was my father's fried matzoh, or matzoh brei as I have come to learn it is called. 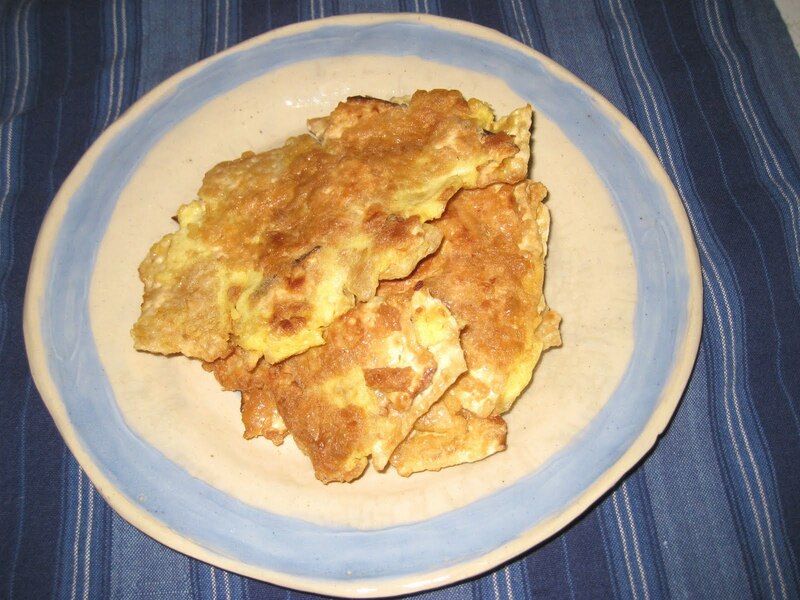 Matzoh brei is basically a version of french toast that uses matzoh instead of bread. 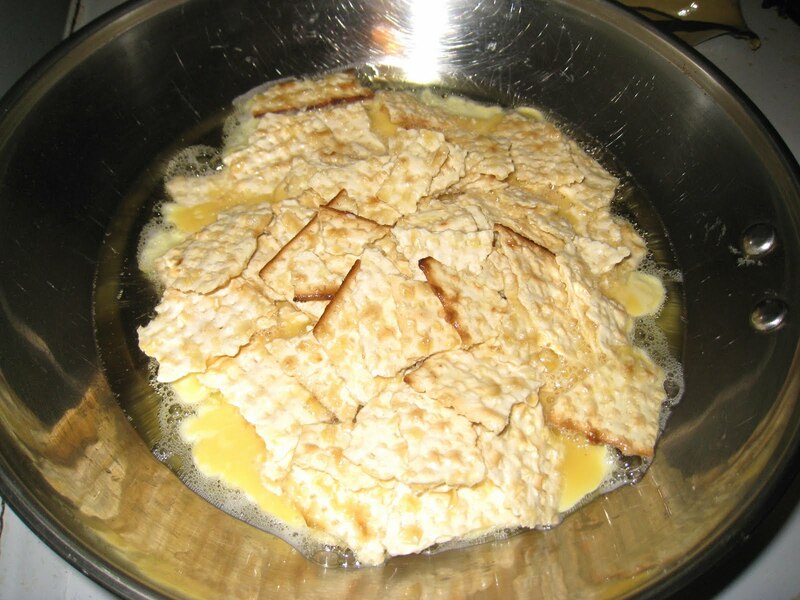 You take the matzoh, break it into pieces, pour boiling water over it over a colander, coat it with an egg mixture, and fry it in butter or oil until the egg sets. I used to love to watch my father break up the matzoh and run it under the faucet, then mix it up with the eggs and cook it over a low heat in the same electric skillet in which he worked such wonderful hash brown magic. When it was done, we would eat it with strawberry jam or apple jelly, and it was delicious with either. For some reason, it did not go well with syrup. Believe me, I tried. I think strawberry jam was my favorite, although these days my jam of choice is apricot or cherry. As with my father's hash browns, I had trouble replicating his skill the times I tried to make fried matzoh in the past. Mostly, I think, it is because I did not have a recipe and just tried to follow what I remembered him doing back when I was a child. It always came out ok, but the matzoh was either too hard or too soggy. I could not find that perfect balance of water and egg to get the soft-on-the-inside crunchy-on-the-outside perfection. I don't know when it occurred to me to look for the recipe in The Settlement Cookbook or why it hadn't occurred to me earlier, but look I did, and there I found the recipe. It turns out that the secret is boiling water. Who knew? After the water has been poured and drained, you fold the matzoh into the egg mixture, then cook it in a large skillet. The secret is that you cook it over a low heat and do not touch it for a while. Like Dad's hash browns, this dish does require some patience. Of course, it doesn't take nearly as long, but the lower the heat and, therefore, the cooking time, the softer the matzoh gets without getting soggy. Matzoh brei is the only Passover dish I would have gladly eaten all year long. If you are looking for something special to get you through the breadless holiday, try this. As with other breakfast goodies, it can also make a delicious dinner. If you are not Jewish or do not celebrate Passover, I would still recommend that you try it. It's quite delicious. Break matzoh in small pieces in a colander. Pour boiling water through them; drain quickly. They should be moist but not soggy. Beat eggs well, fold the matzoh in lightly. Add salt to taste. Heat the fat in the skillet, add the egg mixture. Cook slowly, stirring from the bottom as the egg sets. Continue to cook gently until the eggs are set.